General Payment Schedule is the notice you must serve on a claimant in response to a Payment Claim. It must be posted, delivered or faxed to the claimant to reach them within 10 business days after you received the payment claim. 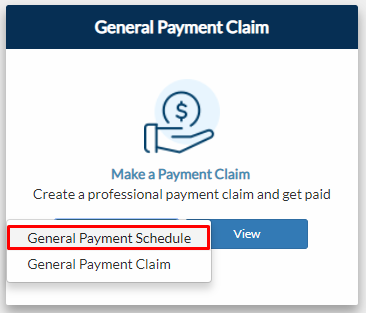 From your project page (if pcs or cppc project), go to Construction tab then click General Payment Schedule on the General Payment Claim tile. From your navigation bar, go to Construction Phase > Payment Claims > General Payment Claim > General Payment Schedule. Or type in 'General Payment Schedule' from the search bar located on the upper right corner of your portal. 2. Input Claimant Business Name. When you type on the field, suggestions containing Supplier names would appear. Once you select the Claimant Business Name, other fields such as Claimant Address, Claimant Representative and Email would be automatically filled out with the supplier’s information. 3. If you have created a general payment schedule, you are required to input a Project Name. When you type on the field, suggestions would appear. Once you select the Project Name that you’re looking for, Project Address, Payment Claim No., Claim Date, and Received on date would be automatically filled out. Note: You can still update Claim Date and Received on date fields. 4. Input Claimed Amount (Inclusive of GST). 5. 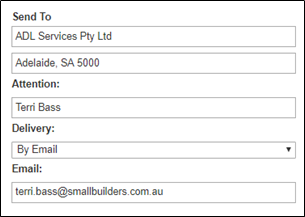 Input Scheduled Amount (Inclusive of GST) and select Due Date for Payment by clicking on the field and picking a date on the calendar date-picker. 6. Identify whether The scheduled amount is the same as the claimed amount or The scheduled amount is less than the claimed amount. If you selected the latter, state on the textbox below Why is the scheduled amount less than the claimed amount. 7. You can attach photos or other documents to support your payment schedule. Just click Choose File to upload a file from your computer.